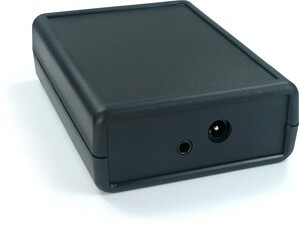 As the PS3 powers itself on whenever a Bluetooth command is received but will only power off through a series of on-screen menu operations, adapter engineers have had to deal with the challenge of creating a simple way to offer reliable control of the console for system automation macros – so it’s powered on and off when it should be. The ps3toothfairy’s solution is a special “Power Track” mode that uses an internal variable to track the console’s power status. When the adapter thinks the system is off, it ignores all button pushes until the [PS] command is sent. Then, when you’re finished with the system, sending [Power Off] transmits an automatic internal macro to turn the PS3 off, finally putting the ps3toothfairy into a sleep mode where it will ignore any other command until [PS] is sent once again. The macro used to turn the PS3 off can be customized between short and long versions, depending on what the system is primarily used for, and the power tracking features can be disabled entirely if desired. It’s also possible to disable the power off macro, but continue to have the adapter track power status. In the end this feature does add some reliability to system automation macros, but faith-based tracking can become out-of-sync by someone using the console’s physical power button, or powering it off through manual steps. At any rate, hitting the [PS] button should correct any synchronization issue. Should Sony decide in the future to change the system’s menu layout, the ps3toothfairy offers complete onboard reprogramming of the power off macro, allowing up to 24 steps with both custom hold and delay times on each step. A feature completely unique to the ps3toothfairy is the ability to send all of the PS3’s special combination keys. The Bluetooth protocol used by the original Sony remote supports a wide range of dual-combination commands, but until now they’ve only used [Start] and [Enter] for remote pairing. Should Sony ever require a different combination of commands, the ps3toothfairy is ready and able to send all possible variations. In fact, the initial pairing procedure is a few button pushes longer than other converters because it’s simply using one of these dual-key combinations for the process. This dual-key mode can be accessed at any time during normal operation by pressing the [Angle] key followed by the two keys you want to combine. However, since this assignment does prevent [Angle] from performing its normal function until pressed a second time, the function (known as “Attention” in the manual) can be reassigned to any other rarely used function, or a transparent mode can be enabled to turn off dual-key operation except during initial bootup. Finally, the ps3toothfairy is able to hook up to industry standard IR distribution systems with its rear 3.5mm IR port. The adapter will automatically switch between baseband and modulated signal formats, and one of the configuration options is used to select between the internal infrared eye and the external port. For those who don’t like bright lights on A/V equipment, the front status LED can be set to 4 different brightness intensities, including one that’s nearly off. The ps3toothfairy is backed by a full website with complete online support, a well written manual, a FAQ section, plus links to forum threads.